Myths and legends tell tales filled with symbols and images that have helped man explain and understand more about the natural world we live in, as well as the supernatural world that lies just beyond our comprehension. The innate desire to search beyond the natural has challenged many a soul, drawing them into uncharted territory on an enchanted quest to peer into the other side. As we begin to see beyond the veil, we enter through intangible doors braving our way to a greater enlightenment with the divine spirit. Choosing the correct doorway can be quite a challenge. Some have discovered exciting and illuminating new frontiers within their journey, while others find themselves more lost than found. For those walking the higher path, the doorways have led them to a greater understanding of an abstract world that strangely parallels natural reality, showing them that there are stranger things in heaven than on earth. There are many methods used to reach a supernatural reality beyond what can be mentioned in this opening statement. The most conventional method of reaching beyond the veil is prayer and patience; where as the more corrupt and impatient method is delving into the occult to force unnatural results. For one you will receive a duty free response, the other comes with a debt requiring tribute for the forced will. All cultures and faiths differ in symbolism yet they may not be totally dissimilar in all aspects. Rather than compare faiths, I prefer to use my own personal belief as an example. My faith has taught me to believe that by the broken body, the shed blood and the sacred name of a sacrificial savior, I can unlock the veil and enter through the gates of heaven. Other cultures and/or individuals might feel my belief to be absurd, while I personally find it more than acceptable, and perfectly understandable. Because I accept my faith's myths and legends as fact, I choose to understand without prejudice the faith, myths and legends of others as being their personal choice according to their own natural culture. I also believe that even with these differences, we should all live in peace and harmony while we allow each other the right to work out their own course with the Great Creator. We sometimes find ourselves walking a thin line between the natural and the supernatural, unable to distinguish or explain the difference between the two. Just the same, the natural and supernatural have been companions since the beginning of time, as we know it, separated only by a thin invisible veil, often leaving us at a loss for words. Civilizations throughout the world have faced the dilemma of finding a way to share their beliefs with the rest of the world; an example or explanation that is understandable to their own society is generally confusing to outside cultures. The most effective method to explain an abstract concept or journey is through symbology, simplifying the abstract thought so that others can comprehend what is not necessarily seen by most within the natural world? Myths and legends are just that, not necessarily a creative license to tell a story that can't be proven, but a way to explain the unexplainable. Delving into the Cherokee's concept of creation is fascinating to me even though I see creation differently. It is not my way to deny their symbolic explanation as to how the world came into being. Instead, I choose to enjoy the legend, as I embrace my own perception of creation. One Native American myth that has captured my attention is the supernatural symbolic idea concerning the mystical nature of waterfalls. It is the belief that as water travels along its water-bed it is attached to the natural world. It also believe that when the water falls from its heights into a gathering pool below, it creates a liquid veil separating the two worlds, beyond that veil is a world existing only within the supernatural. There are strange possibilities beyond the veil, that there might even exist a greater part of ourselves that is divinely guiding us even though we might not be aware of it due to our attachment to earthly living. I believe it's more difficult for most of us to peer into that veil, than it is for the supernatural to occasionally push its nose out through the veil to remind us we're more connected to the supernatural than we think. We are truly blessed in this country to have the right to our own choices in what we believe. We are all one people; only cultural understandings divide us from being more united. We should embrace other cultures' need to believe in their own concept of their origins, whether we understand or believe in their symbolism or not. Peering into the veil with an open mind can allow us all to see more clearly and understand as one people under God. Enough rhetoric ramblings from the podium for now, I sincerely hope you enjoy this feature story as much as I have enjoyed sharing it with you. The first humans to admire, revere and respect Black Bears were the Native Americans of Eastern North America. The Cherokee were the nation that dominated these mountains before the arrival of the Europeans. Some historians claim the Cherokee have inhabited these southern highlands for only 500-years, after migrating here from the Great Lakes or the Ohio Valley region. Though the Cherokee did live in the upper Mid-West, their myths, legends and tradition have placed their origins here, in the heart of the Blue Ridge Smoky Mountains dating back thousands of years. Archaeological studies at an ancient, prehistoric Native American man-made earth mound, has unearthed evidence confirming that the Cherokee people are descendants of the ancient Tsalagi people, which originated here some ten thousand years ago. This very important archaeological site lies along the southern reaches of the Great Smoky Mountain National Park. The ancient village is located along the northern banks of the Tuskasegee River in Swain County North Carolina and is situated between the towns of Cherokee and Bryson City. The access point to the site is on the northern end along US 19/74. This ancient mound village is called Kituwah, also known to the Cherokee people as the "Mother City," site of the Scared Fire of Keetoowah. The Cherokee still consider this a very sacred site. The site consist of an ancient mound surrounded by level fields and enclosed by tall mountains and foothills, there are currently no inhabitants at the village site. This ancient mound village is open to the public to view by those who respect sacred sites and native culture. Today, the Cherokee still use the ancient village grounds for occasion tribal events. It is disrespectful for visitors to stand on the mound or allow children to play on it. The grounds are not available for gathering by the public without direct permission from the Tribal Council. It is believed that the Cherokee began returning to their mountain homelands in mass around the 1400's A.D., this return was likely prompted by conflicts with other northern tribes. The Cherokee were here at the time when DeSoto and his army of Conquistadors arrived in the area during the 1550's. At the height of the Cherokee nation's dominance around 1650 A.D., the Cherokee Nation inhabited parts of 7 states in southeastern North America, occupying at least 200 Cherokee towns. The Cherokee would have known well the Black Bear in the northeastern parts of North America as well as the southeastern regions of North America. The Black Bear, also known as the "American Bear" has in the past, had a long-range for habitat across the North American continent, including Black Bear sightings that have ranged from Florida to Alaska. Today the reasons we associate the Black Bear with mountainous regions is the fact that it's the last remaining wilderness that wild bears have left to inhabit from the overall encroachment of humans across this vast nation. The Cherokee, along with all the other Northeastern American tribes were comfortable living with the local Black Bear population. Yet it's the mountains of the southern Blue Ridge, especially the sacred mountains that "Smoked," that have given rise to many Cherokee myths and legends concerning the Black Bears. Though the Cherokee believed in monotheism, one God, they often saw reflections of the Great Spirit in nature and wildlife. Figuratively speaking all religions contained symbols that include a relationship between the physical world and the spiritual world. Things like serpents and weeds reflect a dark negative world where as doves and olive branches represent love and peace. While lions and lambs stand for courage and innocence. The White Bear (on a rare occasion, Black Bear are born with a natural white fur) was a significant part of the Cherokee ceremonial or religious practices. It could be speculated that there was a personal attraction or spiritual kinship to the Black Bear by Native Americans. This could have derived from the Black Bear's physical characteristic. Black Bears stand upright, offer vocal content (bear grunts, moans groans and blowing,) and their forearms and paws move similar to humans wearing large mittens with claws. The Cherokee Nation consists of seven clans, the Blue Clan, Long Hair Clan, Bird Clan, Paint Clan, Deer Clan, Wolf Clan and Wild Potato Clan. It is the Wild Potato Clan that also is known as the Bear Clan plus the Raccoon Clan, or Blind Savannah Clan. The relations between the Wild Potato Clan and their alias the Bear Clan may come from the idea of foraging. The Wild Potato Clan was known to gather wild potato plants in swampy areas and along streams to make flour or bread for food. Black Bear are considered omnivorous and are quiet efficient at foraging numerous plants, berries and nuts as well as meat and fish, another similarity that they had with the Cherokee people, their diet. Cherokee tales of the Black Bear are legendary here in the mountains, tales that can be either fact based, spiritual or mythical in origin. These Black Bear legends, along with many more Cherokee legends are affectionately shared in order to maintain a native tradition, relating this knowledge to others so that they won't be lost from posterity. What the Cherokee people felt and believed about the Black Bear, add to the overall make up of who the Cherokee are as a people and their connection to this world, and as individuals connected to the spirit world itself. The Cherokee have often seen the Black Bear of the "Smoking" Blue Ridge Mountains, as a symbol of a guide or as a spirit guide, an elder and an ally to the Cherokee people. Tales are told revealing their personal relationship with the bears in both the spirit world and in the physical world. The Cherokee not only revered the Black Bear as a spirit guide and personal totem, the black bear was also a resource for clothing, bedding, food, oil or grease, bone tools and jewelry-like adornments. A bear skull with hide could be used as a headdress while other items such as claws or robes of hide could be worn or used in their ceremonial practices, or worn as a sign of achievement by brave warriors or hunters. With all that has happen to this land of the New World since the arrival of the first Europeans roughly 500 years ago, it is the Cherokee and the Black Bear that have stood the test of time and have diligently and bravely remained here in these mountains with all odds against them. A priceless bond united in brotherhood between man and beast, a legacy of myths, legends and facts that remain a treasure for us all to cherish. 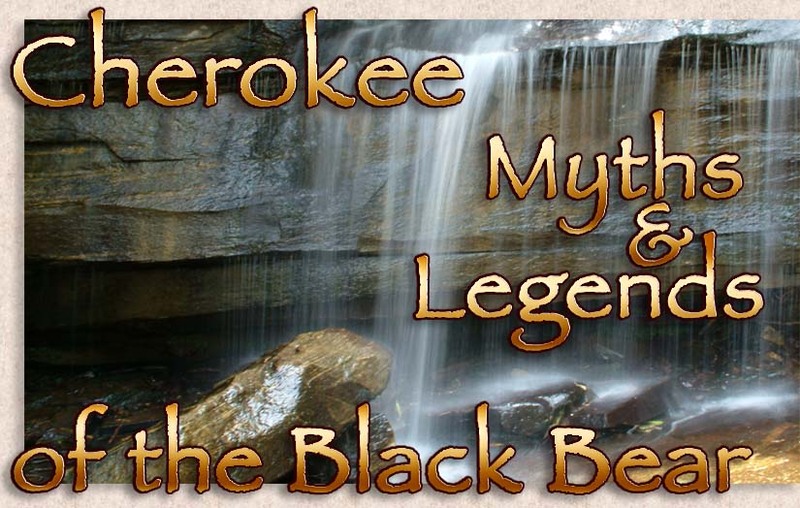 Below are several legends and myths of the Cherokee concerning their brother in both life and in spirit, the Black Bear, the beloved and noble beast that has always maintained a rightful and sacred relationship with these Blue Ridge Smoky Mountains. The Cherokee people called them, "Kuwah'hi" or Sacred Mountain. Today we call them the Smoky Mountains, the single longest and second highest mountain range in the Blue Ridge Mountain Province. When the Cherokee speak of the Sacred Mountain, "Kuwah'hi," they are specifically talking about the pinnacle crown of the Great Smoky Mountains, Clingman's Dome. Here at its highest wind blown and remote reaches of the upper Smokies, it was believed by the Cherokee people that the "Great White Bear," ruled the spirit world above all the earth. The white coloring is rare yet not uncommon with the Black Bear's standard cinnamon, blue tint or traditional black color. The white color is not an albino trait but an actual white pigment tone. The color occurs due to a mutation in a particular chromosome and does not hinder the physical presence or health of the Black Bear. Black Bears acquired their name by early Americans who mostly encountered the black colored bears. As settlers move westward they began to encounter other variation of the Black Bears different coloring. Images by artists of "white" Black Bears can be seen around the Blue Ridge Smoky Mountains. There's a Cherokee legend that tells of one Cherokee clan who called themselves the Ani Tsa'gu hi. Their tale is of an unusual quest for their entire tribal clan. It is told that a young boy of the clan kept disappearing into the forest only to return to the village a little hairier each time. The elders of the tribe ask the boy what was going on, the youngster acknowledge that he had been spending time with the bears of the forest sharing their foods and ways, He told the elders the bears had plenty of food and that the rest of the tribe could join him rather than go hungry but first they would have to fast in order to prepare for the transformation. Informing the other tribal clans, this Ani Tsa'gu hi clan chose to follow the boy and leave the human world of struggle and hunger behind and live forever with the Black Bears in their abundant forest. Upon their departure from the known world of Cherokee towns and villages, the Ani Tsa'gu hi, informed all the other Cherokee clans of their departure, "We are going where there is much food. Do not fear to kill us, for we will be ever alive. " It's not hard to imagine that there are some Cherokee living in the mountains today, who think descendants of the Ani Tsa'gu hi clan that might still be living in the mountain forest as Black Bears. There are also tales of how humans might be the descendents of Black Bears losing their fur and changing their ways. In the myths and legends of the Cherokee people there is a belief concerning a mysterious lake, high in the upper reaches of the Smoky, Blue Ridge Mountains. It is said that all the mountain animals well know of this mysterious" healing lake" and go there to be healed of their wounds. It is said that whenever a Black Bear is wounded by hunters, or in battle with another bear or large animal, that the Black Bear will makes the long journey to this mysterious lake. Arriving at the edge of the mountain lake, the Black Bear will plunge into the cool refreshing lake waters on one side of the lake, then swims across the lake to the opposite shoreline. Legend say's when the Black Bear exits on the opposite shore, they're completely healed of all their wounds. Healing waters are the things of legend and myth that exist throughout the world and other cultures. Possibly the myths concerning the "Fountain of Youth" are a part of this idea of healing waters. A giant bear was reported to four hunters in a nearby village, these four brave hunters were also brothers who's exploits as hunters were legendary. A monster of a bear called Nyah-gwaheh was stalking and terrorizing the village in a neighboring territory. The people of the village were so afraid that even the children did not play in the woods. To conquer the giant bear, the hunters must find the bear's tracks first and take the lead in pursuing the bear. If the giant bear were to spot the hunters first it will pursue the hunters to their end, this giant bear was considered to have powerful magic at its disposal. Whenever the people of the village had tried to follow the bear's tracks the tracks would quickly disappear. The four hunters had magic of their own, that being a very special small dog that had two dark circles above its eyes. The little dogs name was "Four Eyes," and could follow trails that were many days old. Pressured to find the bear's tracks first they pressed on without delay. One of the four brother hunters was considered to be the fat and lazy one of the hunting party even though he was a good hunter. This brother always wanted to eat and rest while the other brothers felt the urgency to find the bear before it found them. While pressing onward in pursuit of bear tracks the fat lazy brother opened his pemmican pouch and retrieved a snack. To his surprise the contents of the pouch was that of pale squirming things, a magical sign that the giant bear was wise to their hunt. As the bear and the hunters tried feverishly to pick up each other's trail, the small dog began to yelp, signaling that he had just picked up the bear's tracks. They rejoiced being the first to pick up the trail and now the giant bear knew it was he who was the one being pursued and began to run. As the bear broke through the brush the four hunters could see the gigantic bear, the bear was so white that it seemed almost naked, void of fur to them, and the swift chase was on with the hunters in hot pursuit. The bear ran and ran all day to evade the hunters, who never gave up the chase. The giant bear Nyah-gwaheh was so large it was easy to follow due to the destruction it left in its fleeing wake. The bear climbed higher and higher up the mountain slope with the hunters in close pursuit. Finally the fat lazy hunter became so tired he faked a fall and twisted his ankle just to get some rest. The other three brothers would have no delay, two of the brothers at a time took turns carrying the lazy brother without losing a step, and the other brother led the party carrying the spears for the others. The brave little dog stayed on the heels of the giant bear nipping at its tail as the bear tried to stay ahead. It was getting dark when both parties reached the top of the mountain, and they were all growing tired. By now the fat lazy brothers had rested enough that he grabbed his spear and took off ahead of his tired brothers. As the giant bear grew too tired to run any further he turned in his tracks to put an end to the little dog nuisance, when suddenly the rested hunter drove forward and thrust his spear through the heart of the giant bear killing him dead. Believing they had defeated the magical powers of the great giant bear, they cut him up and began to feast on its fire-roasted flesh there on the mountaintop, dripping bear grease created sparks in the fire. As they sat back filled with roasted bear, one of the brothers looked down at his feet and saw small sparkling lights in the darkness far below his feet. To their amazement they discovered they where not on a mountaintop at all, the powerful magic of the bear had led them up a strange trail and into the world of the sky. At this time the little dog began to yap as the pile of bear bones began to come alive, the hunters quickly grabbed their spears and began chasing the great bear across the sky. Legend has it that each autumn the hunters chase the great bear across the sky until it is kill once again, as they cut up the bear for their meal the blood falls down from the heavens coloring the leaves of the maple tree scarlet while the fat drippings from their fire turns the grass to white. They say you can read the story in the skies. As each autumn comes the stars in the heavens forming the Big Dipper is positioned upside down with its bowl representing the great bear upside down and dead, the stars in the handle represent the hunters and the small dog in pursuit the bear. When spring arrives the Big Dipper can be seen upright in the heavens representing the great bear turned upright reborn and being chase once again across the heavens by the hunters and their special little tracking dog. There's always an element of truth or reality in most myths and legends, as it forms the character, culture and history of people and should not be regarded as exaggeration or fairy tales. All cultures and faiths derive from the telling of supernatural occurrences, it is a way to unite the natural world we live in with the supernatural world we have difficulty in understanding and explaining. Our lives in this world consist of more than merely the organic. Myths and legends are what we have evolved from as a species; it is what has made us the people we are today. It's our responsibility to remember the past whether it makes practical sense or not, regardless of what you believe, "we weren't just born yesterday."